Have you lost your Volkswagen car key? Do you need a spare set of Volkswagen keys? Are you suffering from faulty Volkswagen car keys? Lost Your Volkswagen Car Key and Need A Replacement or Spare? 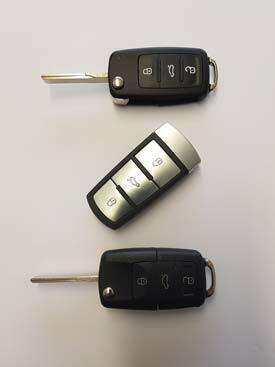 We can supply, cut & program remotes and keys for a wide range of Volkswagen vehicles - including 3 button flip remote for models including Golf Mk4, Golf Mk5, MK6 and 7, Up, Lupo, Bora, Jetta, Beetle, Transporter T5 and T8, Touran, Scirocco and Caddy, Eos, Sharan, Amorak and Polo. For the VW Jetta, we can provide 3 button in dash type remote. We are available 24 hours a day, 7 days a week to provide a rapid response to help solve any issue you may be experiencing with your car keys. As well as replacement keys and remote controls, we can also open locked Volkswagens, provide vehicle locksmith services on the roadside, change Volkswagen lock combinations and remove broken keys from VW ignitions and door locks. If you have had your car keys stolen and need help urgently, any lost or stolen VW keys can be deleted from the vehicle, so they will never work again. All of our services are guaranteed to be fast and efficient, so you won’t be left waiting around - our aim is to get you back on the road as soon as possible.. Our vehicle locksmith solutions are available across the Midlands, Shropshire, Staffordshire, Herefordshire, Worcestershire and Warwickshire.